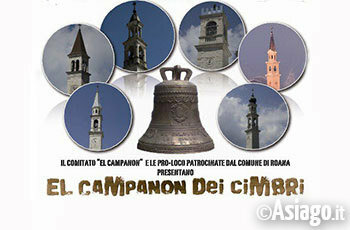 Saturday, July 9, 2016, at the hamlet of in Treschè basin and with the participation of all fractions of the Comune di Roana, held the historic event "El Campanon dei Cimbri". This is the Palio del Comune di Roana, involving all six fractions: in Treschè basin, Canove, Cesuna, Roana, Camporovere and Mittewald. This year will be held in Treschè Hollow. El campanon dei cimbri is an ancient games competition taken back by the craft of Woodman: teams of the same country will give life to a unique challenge seasoned with good food, good beer and Cimbri great live music. Each year the winning team (i.e. one that would take home "El Campanon") will win the next edition of this spectacular event. A careful jury will decide the winner. The start of the event and the meeting is scheduled at 15 at the offices of Pro in Treschè Basin (via funds) with procession to the Church, accompanied by the Town Band and Majorettes of Guntur. It will be near the Church and the sports field to be held all the games and which will be implemented also the rich food stand, running from 19 onwards. Returns a manifestation that did rejoice and excite an entire generation of locals but also tourists who line up from time to time openly for one of the six districts (and factions), supporting them with real cheering from the stadium.